Randolph Tahal being escorted by detectives. 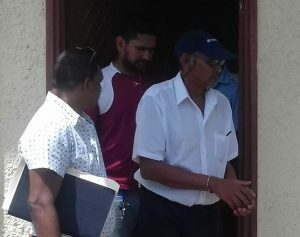 Fifty six-year-old Randolph ‘Joseph’ Tahal on Monday appeared at the New Amsterdam Magistrate Court to answer to the capital offence of murder allegedly committed on his wife. The charge, read by Magistrate Alex Moore, stated that between Sunday 17th and Tuesday 19th September, 2017, her murdered his wife 58-year-old Janet Tahal. The story only came to light after the woman succumbed on Thursday last at the Georgetown Public Hospital. Reports received alleged that the woman was severely beaten by her husband and left for dead at their Lot 98 Symthfield, New Amsterdam home. But, the woman’s daughter had a different account of the events. Jennifer Khan relayed to Demerara Waves Online that the reports of abuse are false she claimed that the post mortem report revealed that her mother died of ‘respiratory failure’ contrary to the reports that she was beaten in the head. “My dad loved his family and he would not have left my mother there to die. In every family, people have differences but I won’t say that my father murdered my mom. He loved her”. Khan stated that although previous reports highlighted that a close relative of her mother discovered her in a semi-unconscious state, it was her father who discovered her mother unresponsive”. “People had said one of mommy relative found her and took her to the hospital but that’s not true. Daddy is the one that came home and saw mommy in the bedroom, not moving and with blood coming from her head and that’s when he rushed her to the hospital”. Khan noted that a CT scan was also done on her mother and revealed that she suffered a stroke.